Description: A mature male bighorn sheep (ram) earns its name, having horns that can weigh 14kg (30lbs). 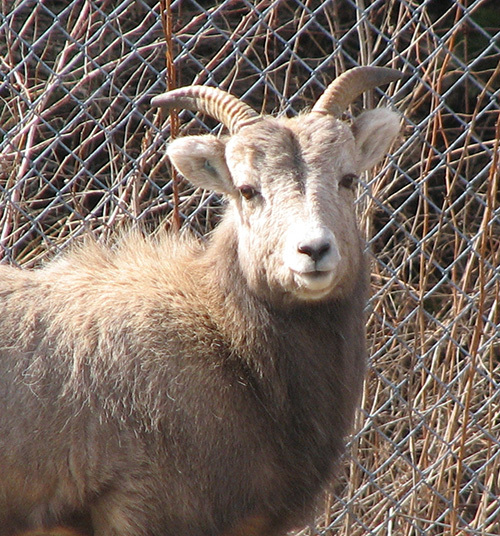 Female bighorn sheep (ewes) also have horns but they are much smaller than those of the males. Bighorn sheep are the largest of the two species of mountain sheep found in Canada (the other being Dall sheep). The subspecies of bighorn sheep found in Canada, the Rocky Mountain bighorn sheep (O. canadensis canadensis) can reach weights of 140kg (300lbs). Coat colours of bighorn sheep range from grey-tan to brown, always with pale fleece on the rump, belly and muzzle. 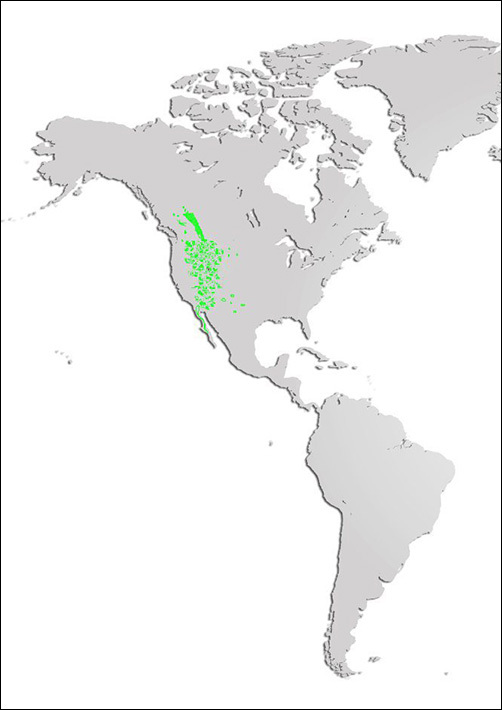 Distribution and Habitat: When European settlers first arrived in North America, bighorn sheep were widespread over the western areas. Populations decreased and became extirpated (locally extinct) in many areas through hunting, grazing competition and disease transmission from domestic sheep. Repopulation efforts in the US have re-established bighorn sheep in several protected areas. In Canada, bighorn sheep have a relatively stable population among the Rocky Mountains and in a few regions throughout southern British Columbia. Diet: Ruminants, like all members of the Bovidae family, bighorn sheep graze on high altitude rocky slopes and plateaus, moving only to slightly lower altitudes during winter. Grasses and sedges form the bulk of their diet during the summer, with hardy woodier plants and shrubs providing their winter diet. Ewes typically graze while in constant motion, presumably to keep themselves and their lambs safe from predators. Rams tend to graze and then rest to ruminate and chew their cud, allowing more efficient digestion which may account for the large differences in body size between ewes and rams. Life Cycle: Bighorn sheep rams fight to establish claim of female groups. Frequent injuries occur and horns are often permanently damaged. The sound of clashing heads can be heard for several kilometres. Fighting sessions may last an entire day and rams will fight year round, with the majority occurring during the breeding (rutting) season. A ram may “tend” to a certain female, following and protecting her, or he may segregate her from the herd even before she enters her season of estrus and keep her to himself until she becomes a willing participant. Lambs are born 6 months later, usually singles, and can walk on the day they are born. They will remain with their mother for the first year of their life. Bighorn sheep ewes live in flocks year-round, joining groups to form large flocks of a hundred ewes and lambs during the winter months. Male groups tend to be smaller, with fewer than 20 rams of varying ages. Lambs are susceptible to predation from coyotes, wolves, lynx, cougars and golden eagles, while cougars tend to be the biggest wildlife threat to mature bighorn sheep as only cougars are agile enough to pursue sheep on the rocky alpine terrain. Adaptations: Bighorn sheep, like all mountain sheep, have specially adapted hooves that are hard on the outer edges and softer in the centre, giving them increased ability to climb on rocky terrain and jump from one rock ledge to another. They also have very well developed senses; their hearing, sight and sense of smell are very acute and allow them to skillfully avoid predators. Did you know? Conservation efforts to save the bighorn sheep in the US are largely the result of campaigns started by the Boy Scout organization in the 1930s.